What is the point of your astrology? 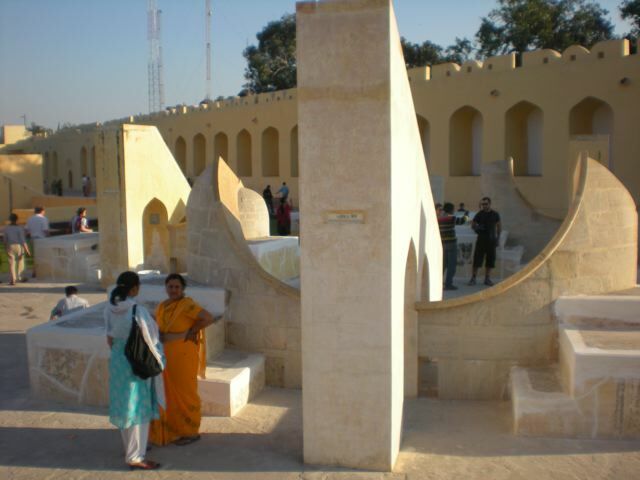 This is one tiny bit of the magnificent Jantar Mantar or astronomical observatory in Jaipur built by Jai Singh II in the early 18th century. Those Mughals took their astrology seriously. I had an interesting conversation with a friend visiting from Calcutta last weekend. He’s an important business associate of my partner, and from his point of view, our prosperity is his prosperity and vice versa. In short, we are all one family in the eyes of the Hindu gods. I am very pleased with this because I’ve always wanted Shiva, Lakshmi and the gang in my house. Because of this interest, my friend likes to make sure our house is arranged appropriately and we’re not doing any silly Western things such as cooking facing South or leaving our shoes in the wrong place. Now, I know a bit about Indian astrology, but I’m no expert. Nevertheless, I recognised the rings on my friend’s fingers as astrological remedies. As you may or may not know, Vedic or Indian astrology, has the same roots as Western astrology, (probably in the Greco-Roman world of the Eastern Med) but since then it has evolved differently. Both systems classify planets as strong or weak depending on a host of factors, including which constellation they are in and what other planets they contact. An important part of an Indian astrologer’s job is to prescribe remedies for any of your planets that are weak or in some way badly afflicted. Say, for example, your Sun was in Aquarius, which is considered to be an unhappy combo. Your astrologer, or jyotish, might give you a special mantra, suggest you fast on a certain day of the week or choose a ring for you to wear. My friend has a weak Sun and a weak Mars, so he was wearing two rings: one with a ruby and one with a coral. He told me that he had only started consulting a proper jyotish 12 years ago when things were not going well in his life. The effects of the remedies had been immediate and dramatic. Initially, things had got worse and then, after he’d got through this tough first barrier, his life began to improve steadily. “Not really,” I said sheepishly. I explained that Western astrologers like to think that the key to a good life is self-knowledge and if you are aware of the energies of the time, you can use them to your advantage or at least try and ameliorate any difficult transits. But I have to admit, the Vedic system has a satisfying certainty. Which might be why I’m considering buying a small emerald for the little finger on my right hand – or should that be left? Can’t believe you’re revisiting this now (FEb 2012)! Why? Because I am too. Off to get a big yellow sapphire. Be careful with all that gem power – BTW. It’s a powerful lot of one small person to have going on. Emerald for Mercury eh? Emerald I think for Jupiter.